Continuing on our autumn theme, PictureIt… went out to the woodlands to discover some of the seasonal mushrooms, which reside along the woodland fringe and hide deep in the leaf littered copse. 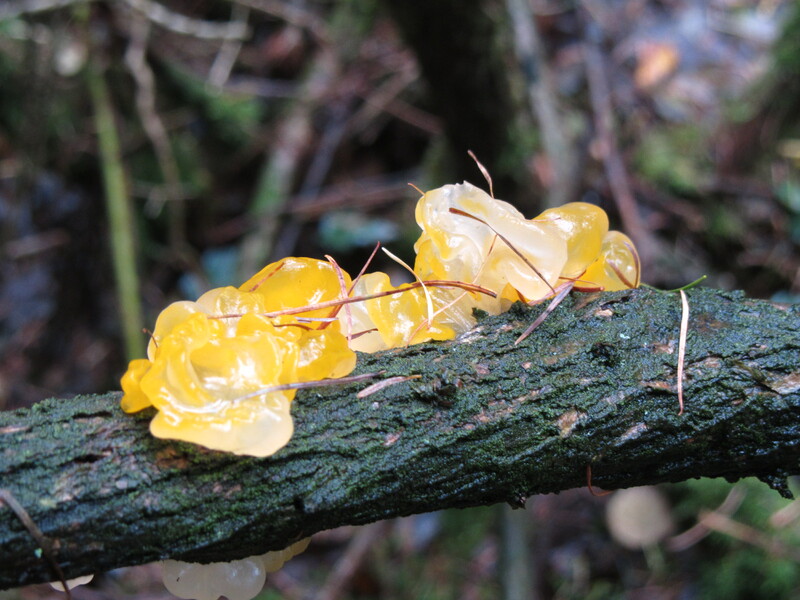 Although not plants, these fungi provide a plethora of molecular level interest, as well as a tasty reward, for the foraging chemist. 1) The mushrooms that we see growing through the mossy carpet of the forest floor are only the flowering part of the fungus, which reside underground. Whilst the average mushroom may be a few centimetres across, the fungal body itself can be metres in size. The fungus produces mushrooms at certain times of year, when the conditions are right for reproduction. As a sexual part of the fungus, the mushroom contains spores, which can become new fungus. Mushrooms have long been considered symbols of magic. Fairy tales often depict a ring of mushrooms as a mystical place of fairies and toad princes; even today, Brownies still jump over a toadstool as a magical part of their enrolment to their pack. The terms toadstool and mushroom have been used synonymously, but these are not the only names for mushrooms; they have been called frogstooles,tode stoles, toodys hatte, and paddockstooles amongst other names (Ramsbottom J., 1954, Mushrooms & Toadstools: a study of the activities of fungi. London: Collins). Historically, the toadstool has been associated with stories of evil and has thus lent itself to species of poisonous mushroom. It is thought that such fear of mushrooms, or fungophobia, has its origins in the UK, where a national superstition of toadstools was first documented (Hay, W. D., 1887, An Elementary Text-Book of British Fungi. London, S. Sonnenschein, Lowrey.). This social fear of mushrooms, and an unhealthy obsession with the poisonous members of the species, has resulted in mushrooms being avoided, however, modern tastes and a desire for all things wild on our plates, has led to a revival in this food source (Arora, D., 1986, Mushrooms Demystified, A Comprehensive Guide to the Fleshy Fungi. Ten Speed Press.). Whilst mushrooms may taste great, they also provide us with a host of interesting molecules. The marshmallow white of the common puffball. 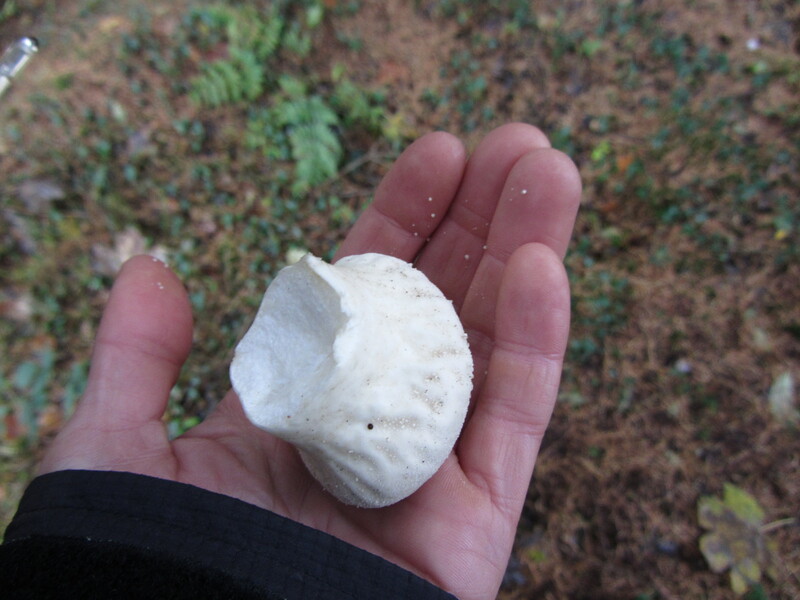 2) We got incredibly excited when we found common puffballs; they grow like little white pillows. Once picked, they have a lovely smell which is due to the release of a family of molecules. An earthy mushroom smell is provided by the ketone 3-octanone. 1-Octen-3-ol, also found in lemon balm, has a green-mold smell. 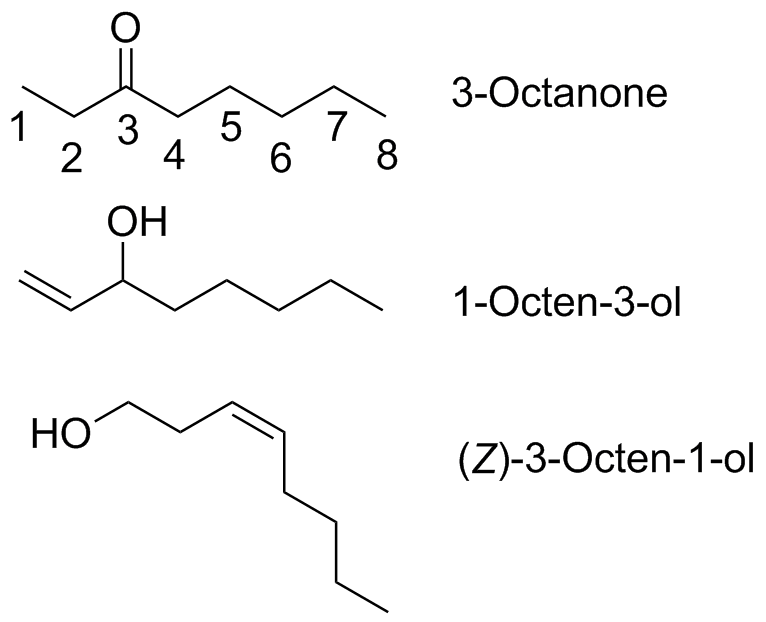 Whereas (Z)-3-octen-1-ol, is found in many fruits, such as passion fruit and banana, and has a water melon scent. All three of these molecules are used in the perfume industry to create scents for toiletries and food products. These molecules all have a carbon-chain backbone made of 8 carbon atoms. Carbon chains are named after the number of carbons in the chain, thus the 8 carbon chain is called octane, and all three molecules have the “octa” part of this in their names. The “ol” is used to denote an alcohol, O-H, group is present and the “one” is to denote a ketone. Because all three molecules have a long carbon chain, they are only sparingly soluble in water. This may be why wine is such a good addition when cooking a mushroom risotto. The ethanol alcohol, present in the wine, helps to solubilise these flavour molecules and so release extra flavour, which would not be released by using water-based stock alone. 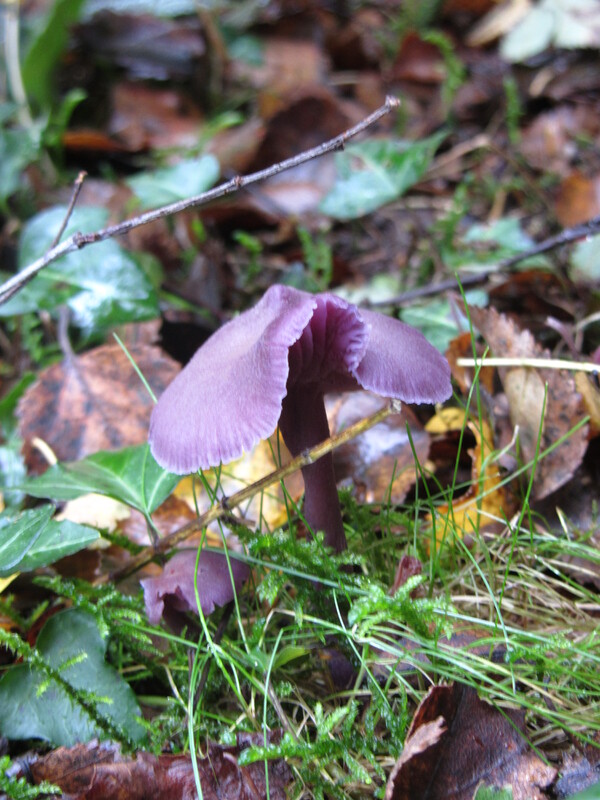 The amethyst deceiver – lovely fragrance and great to eat. The mushrooms which we found on our foraging foray, included a spectrum of colours, red, yellow, brown and even purple; the purple coloured amethyst deceiver was actually our favourite mushroom, for its beautiful hue, amazing deep mushroom-stock scent and lovely flavour. The variety of colours available from fungi has been used to create dyes of all hues, which can be used both on cloth and papers (Beebee, D., The Art of Mushroom Dyeing). 3) Another type of mushroom we encountered were the Lactarius or Milk Caps, which get their name due to the fact they exude a milky substance when cut. This substance is referred to as latex and whilst it isn’t related to animal milk, it is based on fatty acids, just like milk. One of the edible lactarius mushrooms is the Saffron Milk Cap or Red Pine Mushroom, which is unique to Europe and has its earliest depiction in Roman frescos. (www.mushroomexpert.com/lactarius.deliciosus.html). The latex contains a whole host of useful molecules, such as chroman-4-one, derivatives of which are known to inhibit the enzymes involved with age-related disorders (J. Med. Chem., 2012, 55, 16, 7104 – 7113). Anofinic acid can also be isolated from the latex; whilst the carboxylic acid derivative of this compound is active against plant pathogenic fungus, changing this functionality to a methyl ester, means it is inactive to plant fungus but instead active against human pathogenic candida fungus (Phytochemistry, 1996, 41, 1, 111 – 116). Not only can mushrooms help us fight age-related disease but they can also provide a source of vitamins. The table-friendly boletus edulis contain ergestrol, a pro-vitamin sterol. On exposure to UV light, ergestrol is biosynthesised to give vitamin D2 (Food Chemistry, 2002, 76, 3, 293–98). Thus mushrooms can act as a source of vitamin D and therefore be especially important as a nutritious food for vegans. It should be noted, that the amount of vitamin D is only equivalent to that which can be attained by standing in the sunlight but during the darkening winter months, an extra boost of vitamins can’t be a bad thing. The boletus edulis also contains ergosterol peroxide, which has shown antimicrobial, anti-inflammatory and cytotoxicity to tumour cells (Food Chemistry, 2008, 113, 1, 351–55). Toadstools lurking in the woods. Deep within the shadow of the tress, we could not help but be drawn to the enticing red shine of a big fat fly agaric mushroom. It sat like something from the fables and fairy tales; a mythical beast in the deep of the woods. Perhaps it would be more reverent to refer to fly agaric as a toadstool since, despite its alluring appearance; it is toxic and has been used in various cultures as an hallucinogenic. The fly agaric contains high levels of ibotenic acid, which is itself toxic if ingested, and is a precursor for the key compound responsible for the toxicity of this fungus. When fly agaric dries out, ibotenic acid decarboxylates to give the psychoactive compound muscimol. Yet this is not the only way in which ibotenic acid increases the toxicity of the fly agaric (Economic Botany, 2008, 62, 3, 223–43). As the mushroom is exposed to UV light, iboetnic acid breaks down and is converted to muscazone (Tetrahedron Letters, 1965, 6, 25, 2075–76). This structurally similar compound is a bioaccumulator of the heavy metal vanadium. 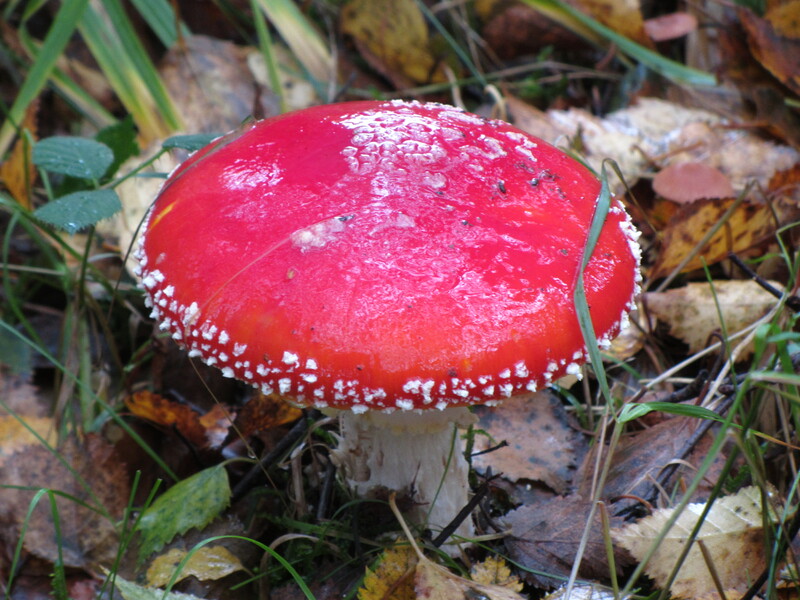 The presence of muscazone in fly agaric and related species can lead to vanadium levels up to 400 times those typically found in plants (Journal of Inorganic Biochemistry, 2000, 80, 17–20). Whilst the biological importance of bioaccumulation is still being explored, the harmful nature of heavy metals, if ingested, is well known (Science Daily, 2009). Ibotenic acid – a precursor to toxic compounds. Stepping from the dim of the woods into the bright autumn sunshine, we bounced downhill with our edible treasures. Safe in the knowledge that our friendly local expert had checked our pickings, we primed the stove and got the risotto rice ready…. And a bottle of wine, to optimise the flavour, of course. Contributors: Jenny Slaughter (words, photos & images), Clare Kent (words, research & forage support team), Tim Gallagher (research & ideas). With thanks to the chaps from the Coastal Survival School, for their knowledge, expertise and culinary skills. Categories: Autumn, Biochemistry, Colours, fungus, Medicine, mushrooms, Posion, Scent, Uncategorized | Tags: autumn, biochemistry, edible, fungus, molecules, mushroom, toxic | Permalink.